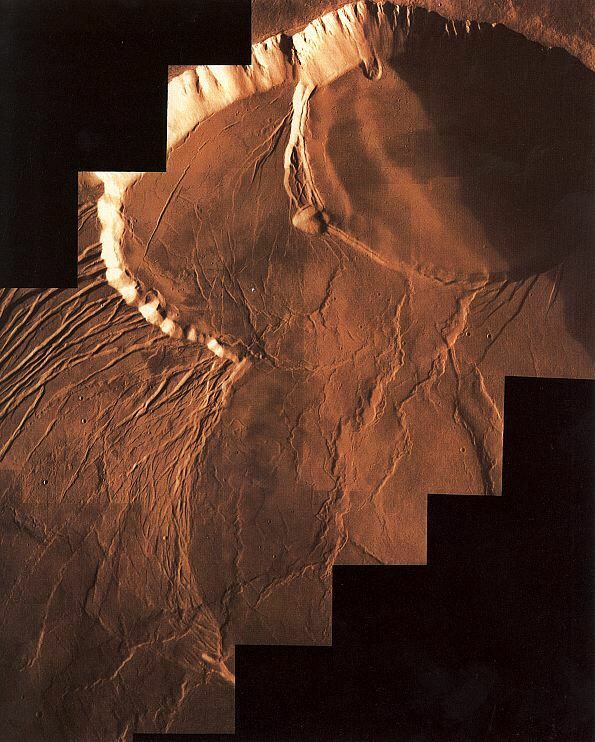 The first images presented herein are global mosaics of Mars, reproduced from Volume 14 of the Mission to Mars CD-ROM set. Select here if you wish to read the caption. 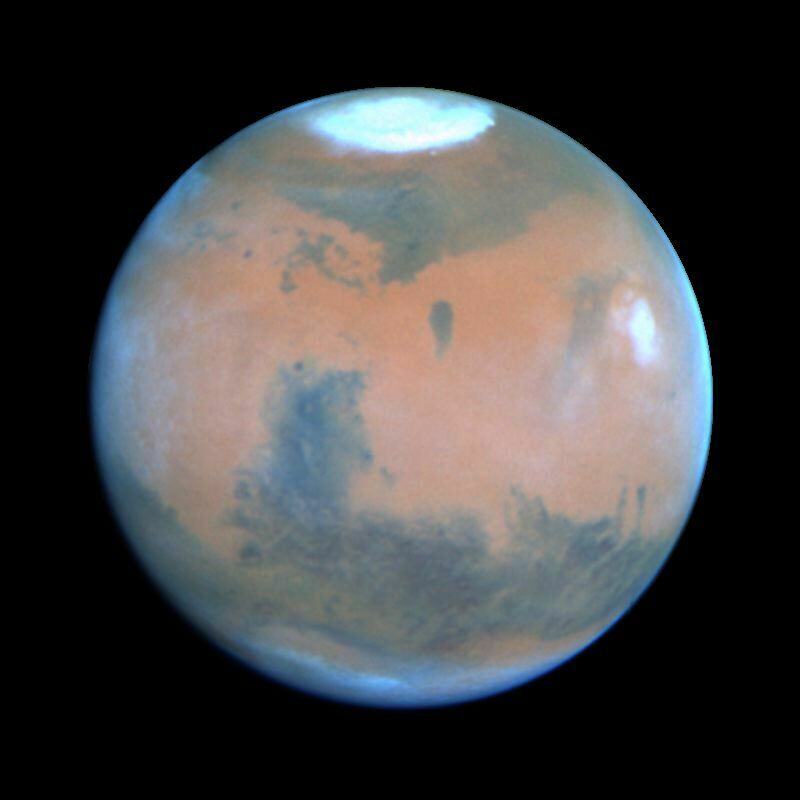 The following three global images were taken by the Wide-Field Planetary Camera 2 on the Hubble Space Telescope. 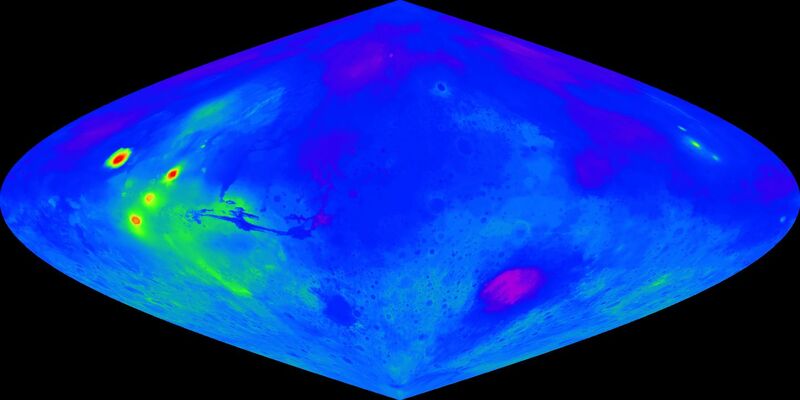 Finally, a digitial image model (DIM) and topographic map of Mars. The first two images here are also reproduced from Volume 14 of the Mission to Mars CD-ROM set. 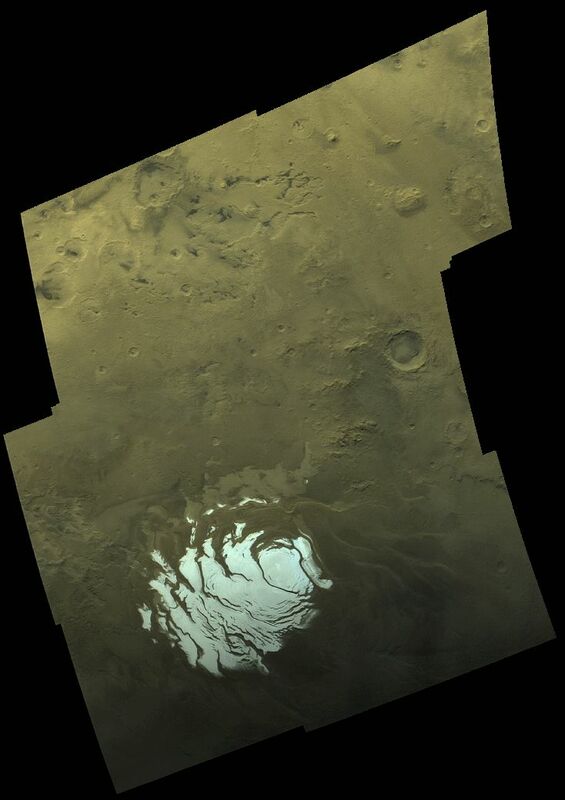 This mosaic shows the southern polar cap of Mars. 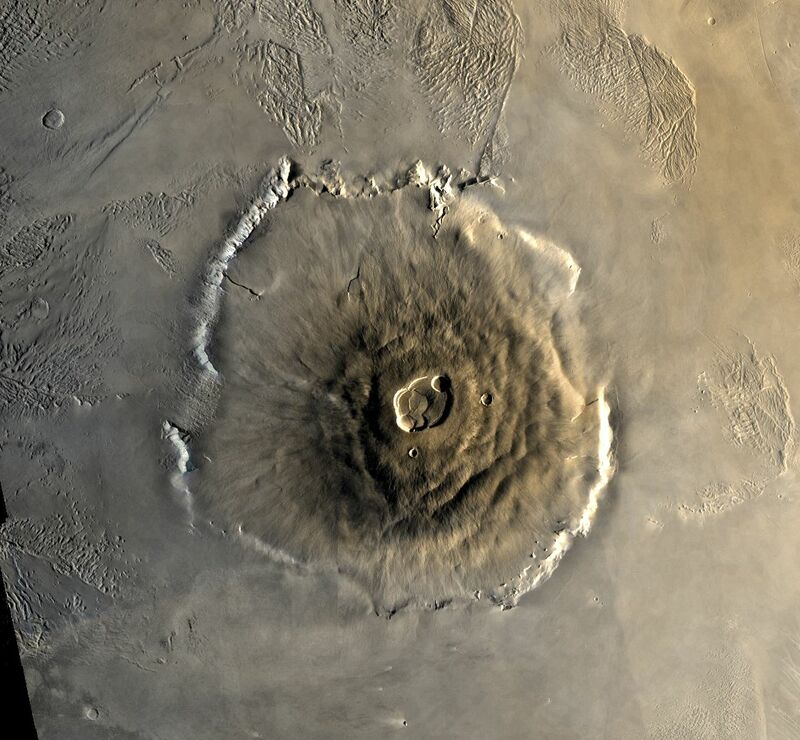 One of the best known features on the Martian surface and the largest known volcano, Olympus Mons. 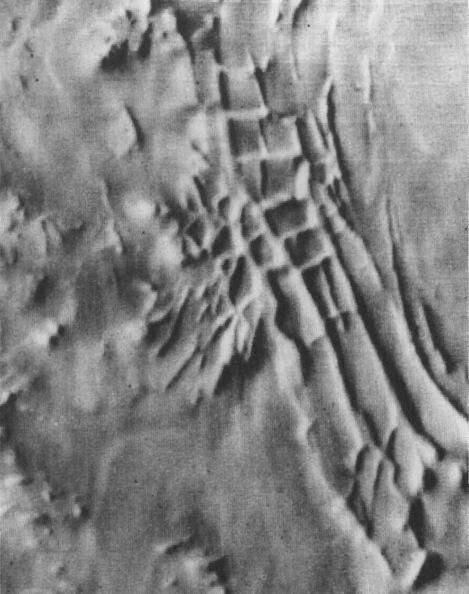 During the Mariner 9 mission, scientists found an unusual rectilinear structure associated with the south polar pitted terrain which they dubbed the "Inca City". 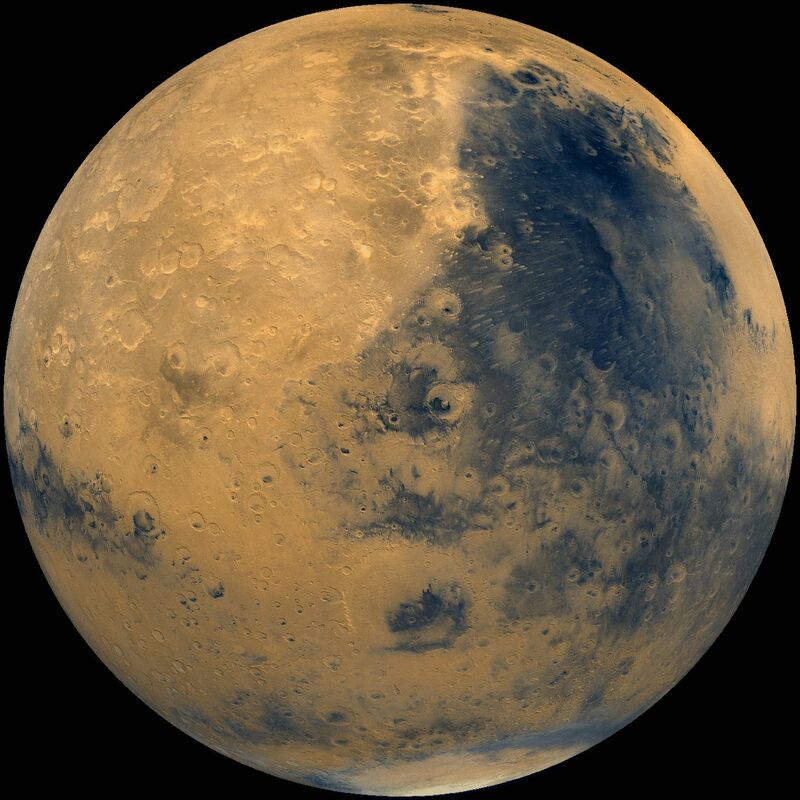 Located near -80 degrees latitude and 64 degrees longitude, it is likely the result of wind deflation of deposits from underllying rough terrain. 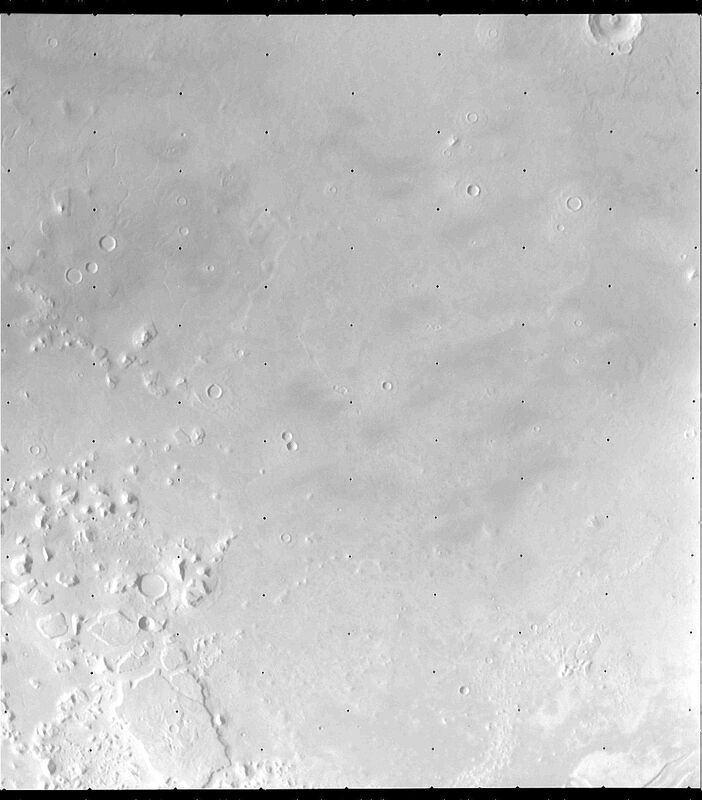 The "cells" in the image are about 4-5 kilometers in width. 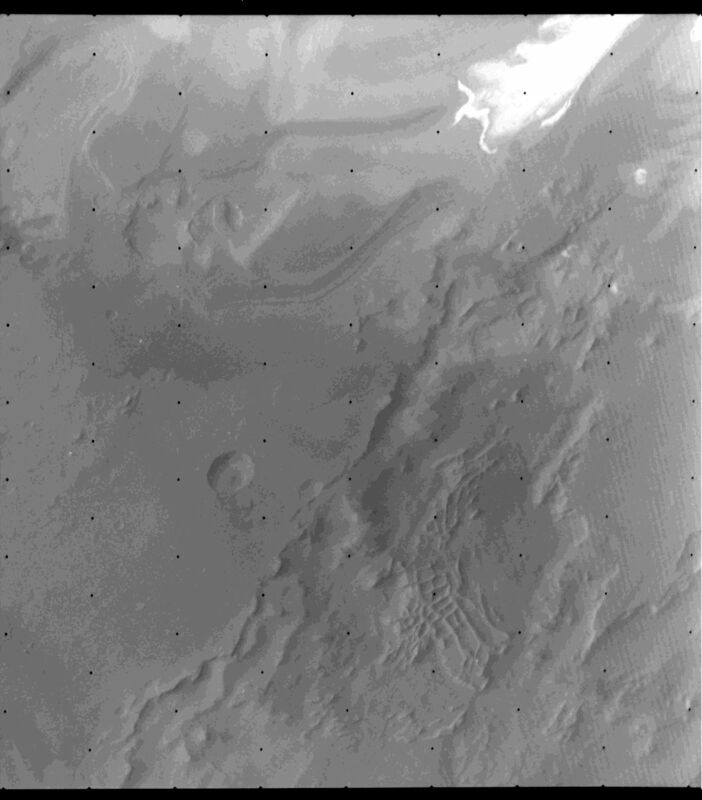 Viking 2 also imaged the region, but no evidence of the feature was visible in this image from orbit 225. 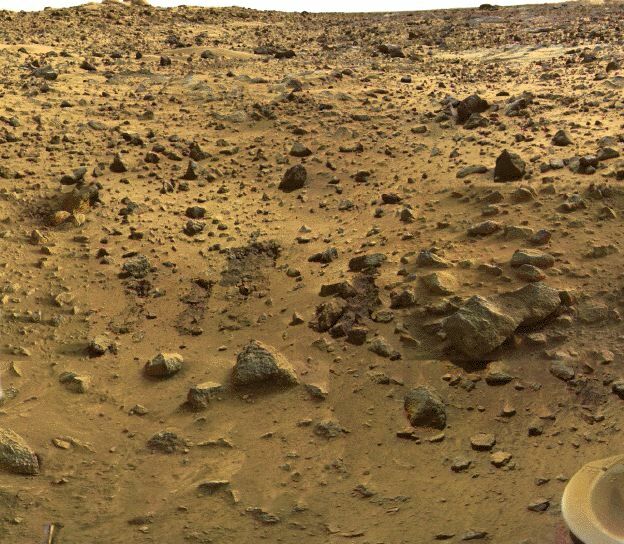 It has been enhanced to bring out the details (noise reduced and contrast enhanced). 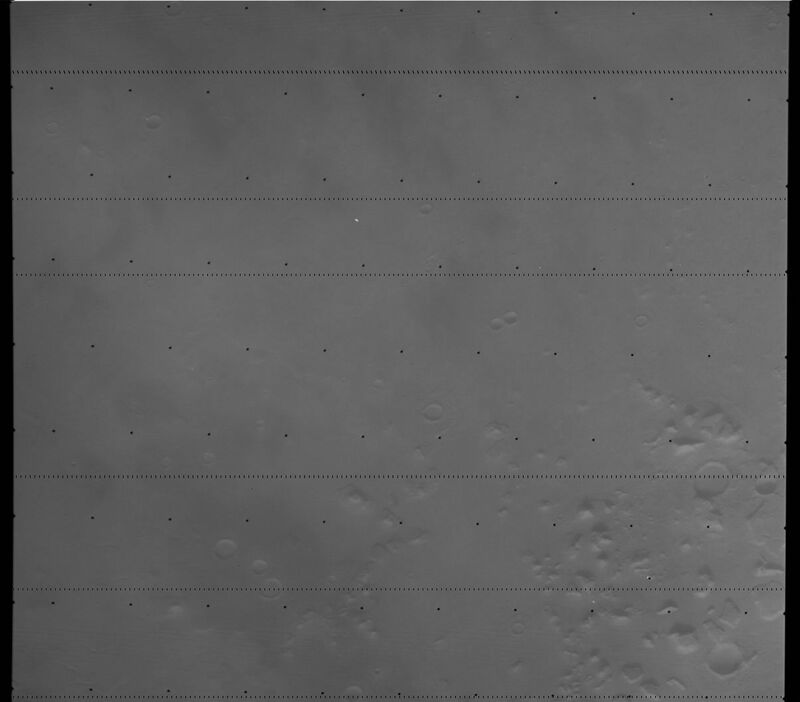 The resolution of the original image is 0.544 km/pixel and is centered at -81.56 degrees latitude and 69.82 degrees longitude. 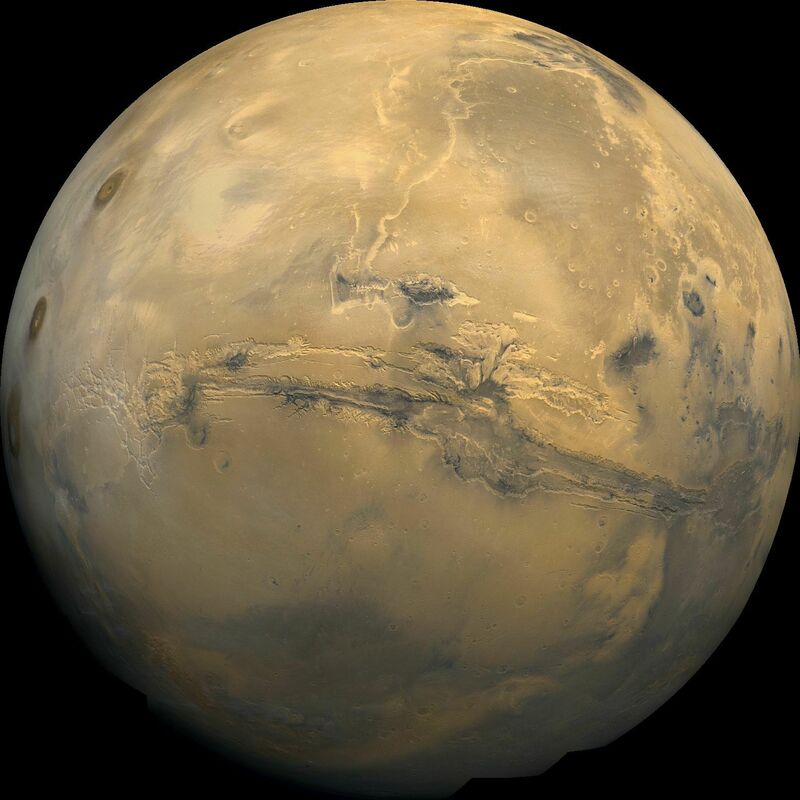 The image is available on volume 55 of the Mission to Mars: Viking Orbiter Images of Mars CD-ROM set. 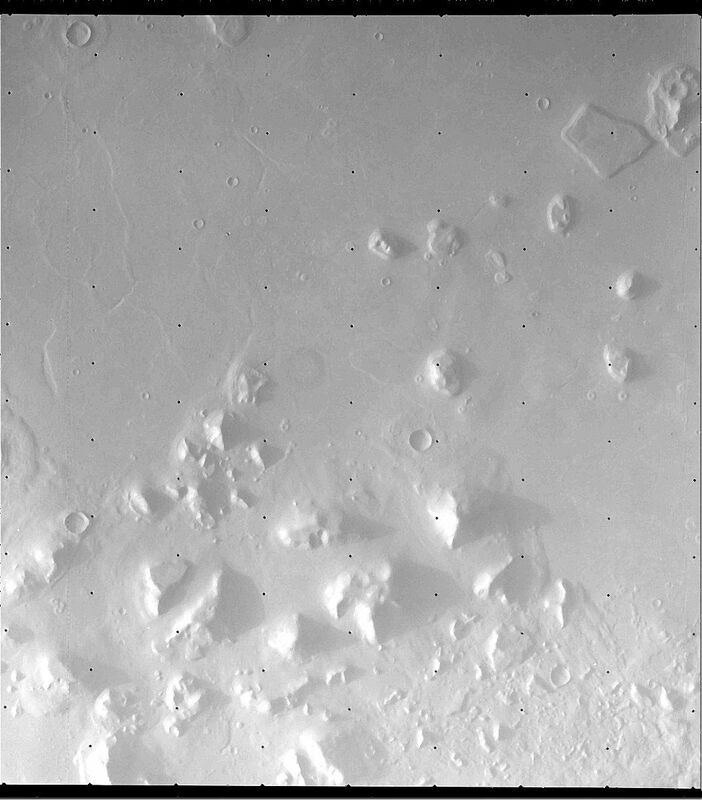 On a later orbit (421), Viking 2 again imaged the region. This time, the Inca City is clearly visible. This image was taken through the red filter. 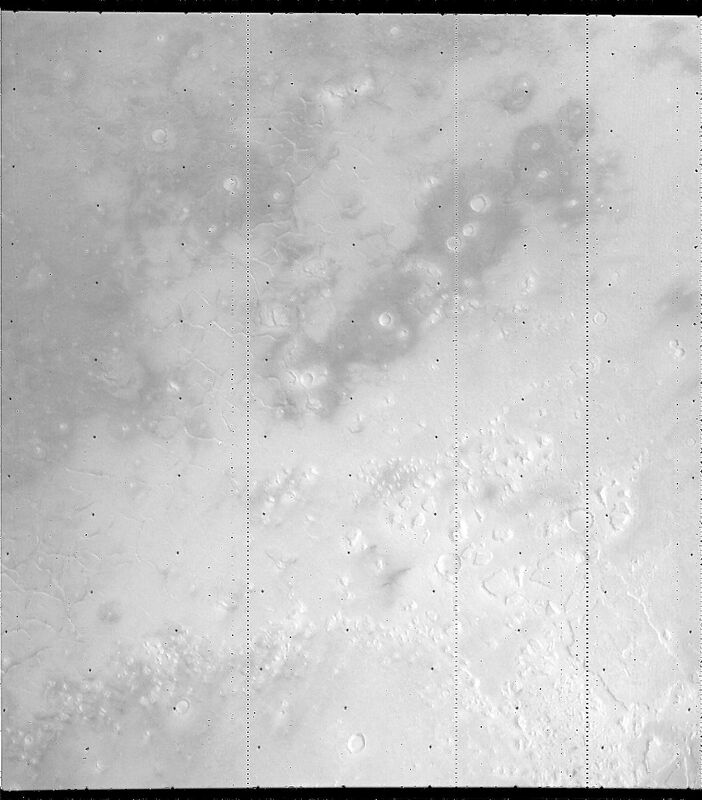 It has been enhanced to bring out the details (noise reduced and contrast enhanced). The resolution of this image is 0.146 km/pixel and is centered at -81.82 degrees latitude and 59.59 degrees longitude. 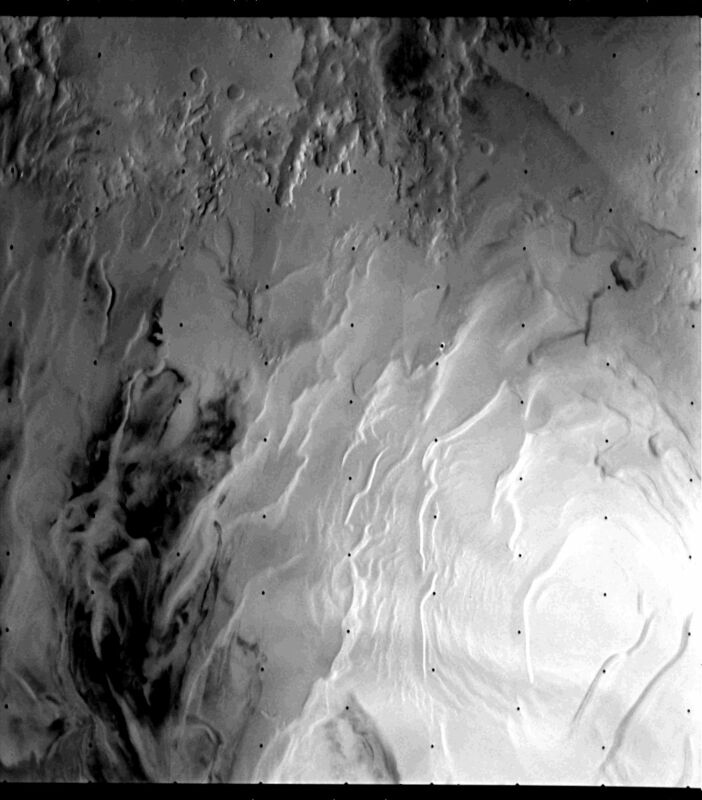 This image is available on volume 59 of the Mission to Mars: Viking Orbiter Images of Mars CD-ROM set. 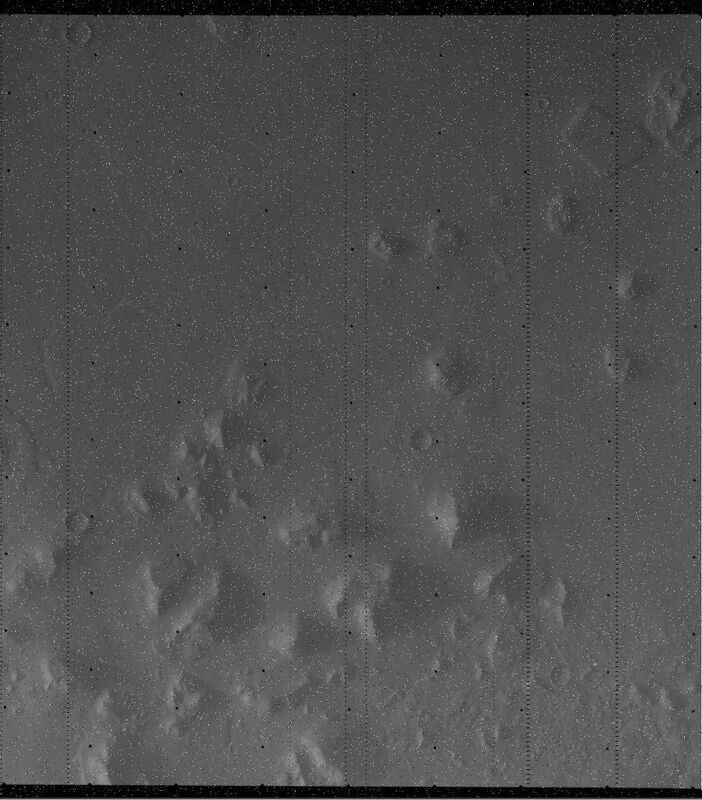 The following images were taken by the Viking 1 and 2 orbiters. They are among the most requested images which NSSDC archives. 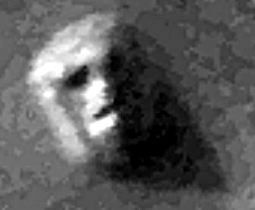 These images were taken of the region on Mars known as Cydonia Mensae and contain the feature commonly known as the "face". 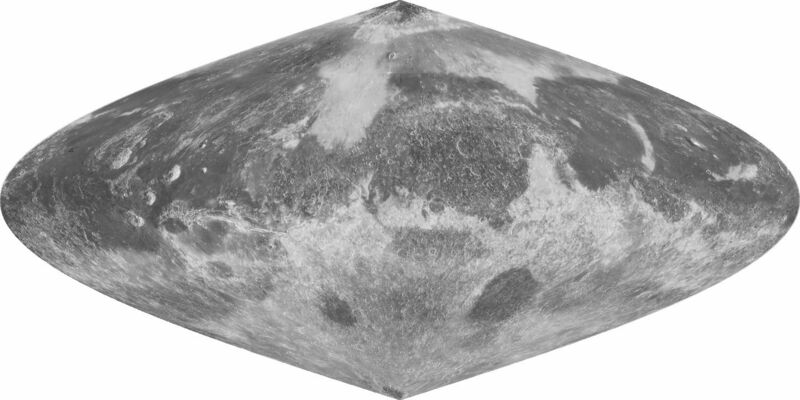 All of the images here have been rotated clockwise 90 degrees to reorient them so that north is toward the upper left corner. There are two versions of the images present here. 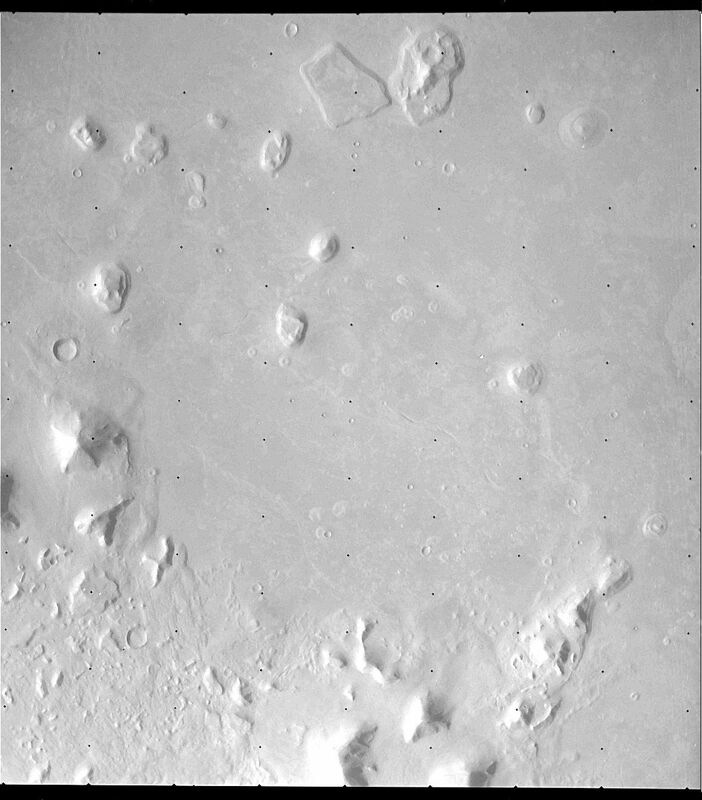 The first of each pair is an unprocessed ("raw") version of the image taken of the area. 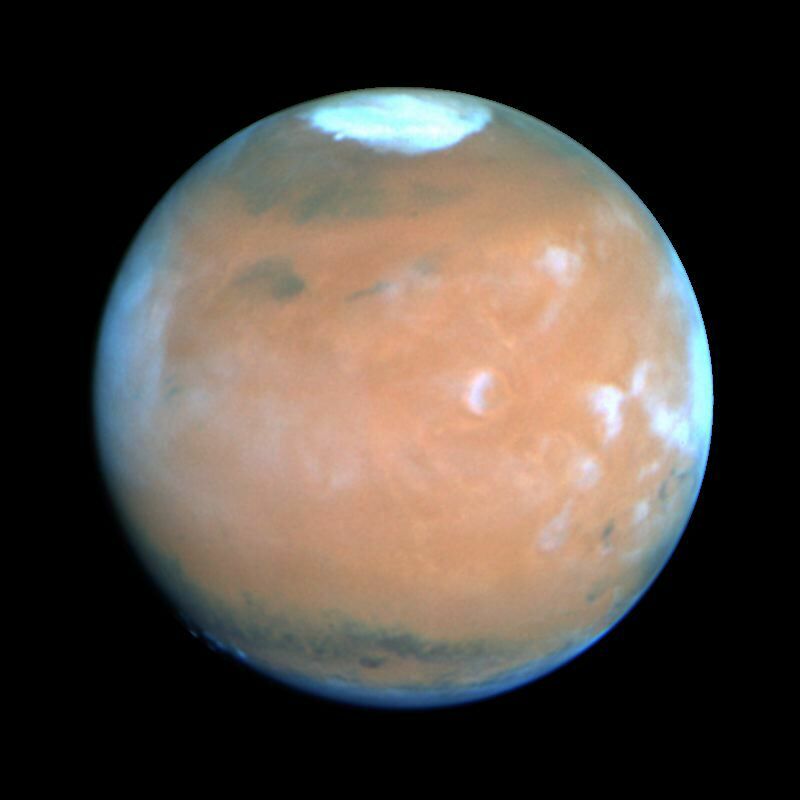 Other than the processing necessary to create a JPEG image from the PDS formatted image file, the images are unchanged from the originals on Volumes 10, 11, 21, 28, and 63 of the Mission to Mars: Viking Orbiter Images of Mars CD-ROM set. The second of each pair has had the noise level reduced and the image sharpened using Image4PDS, a freeware program available from NSSDC. Finally, Color It! (tm) was used to adjust the contrast. 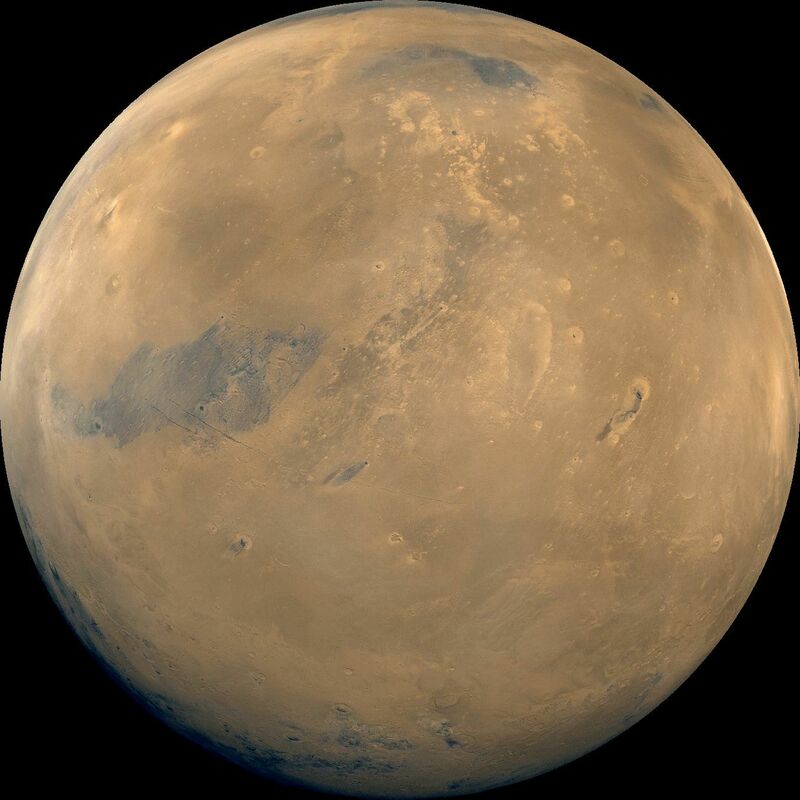 (If you have any questions about the "face" on Mars, please refer to our Planetary Frequently Asked Questions page. Detailed information on the first two exposures (035A72 and 070A13) is also available.) The sizes of these images range from 120-504 KB. 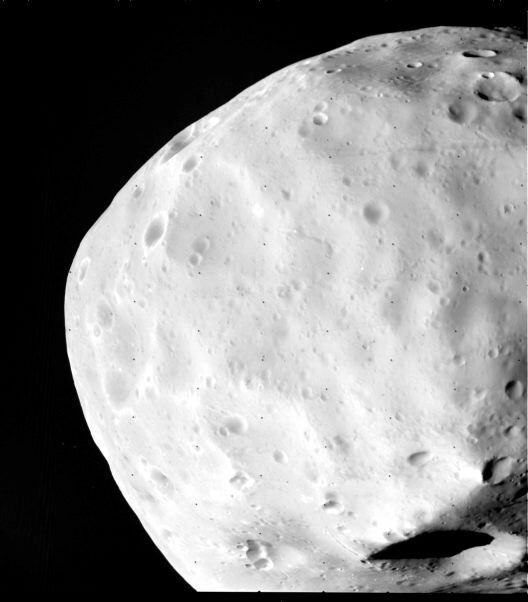 The following images were taken by the Viking 1 and 2 Landers. The first, second, and fourth panoramas were created by Mary A. Dale-Bannister, Washington University in St. Louis. The third was constructed by Edward A. Guinness, Washington University in St. Louis. 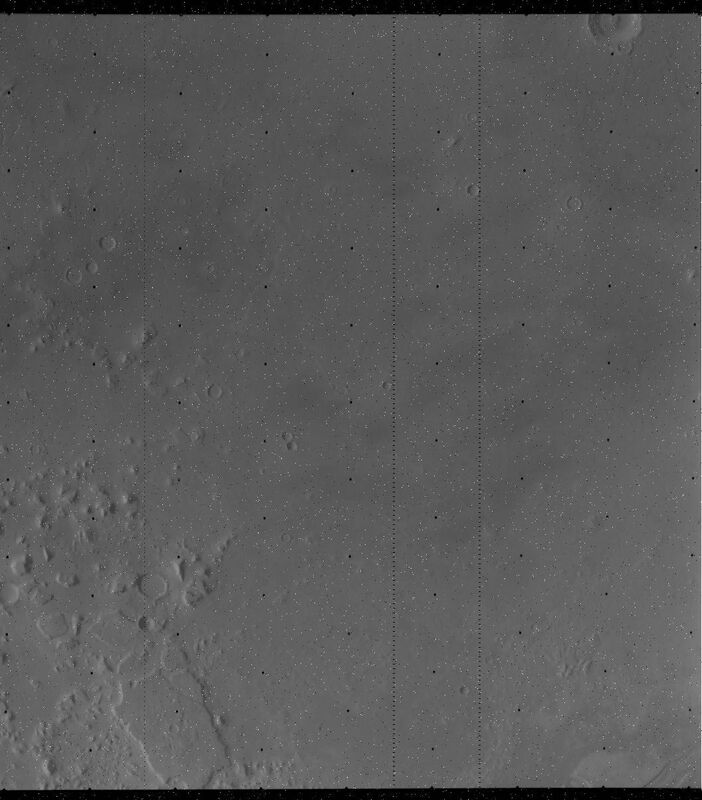 These synthetic high resolution color images were created by combining standard low resolution Viking Lander color images with standard high resolution Viking Lander black and white images, using image processing techniques. In simple terms, the colors are separated from the color image. Using the computer, those colors are then painted onto high resolution images covering the same area. 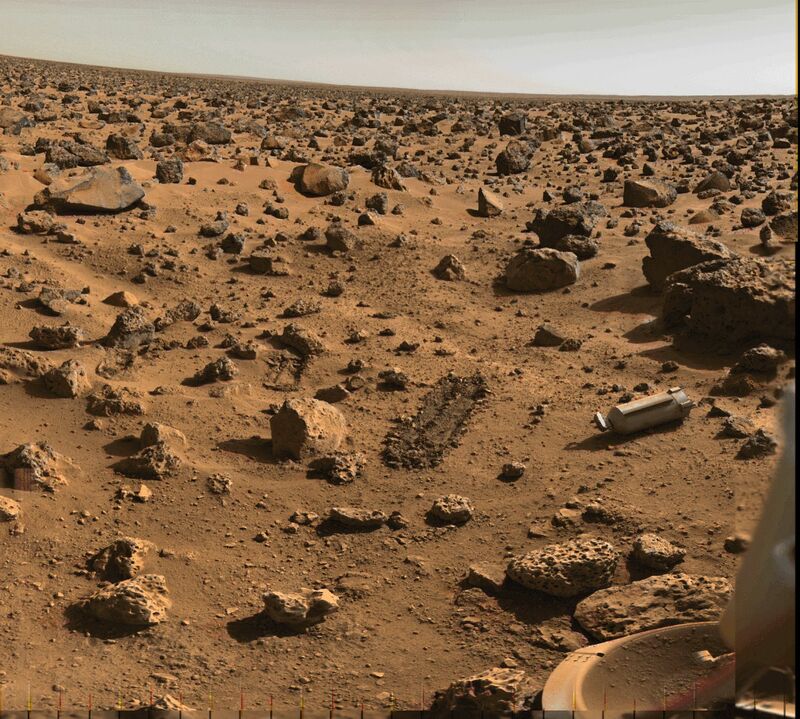 The third image is about what would be seen if the Martian surface materials were on Earth. 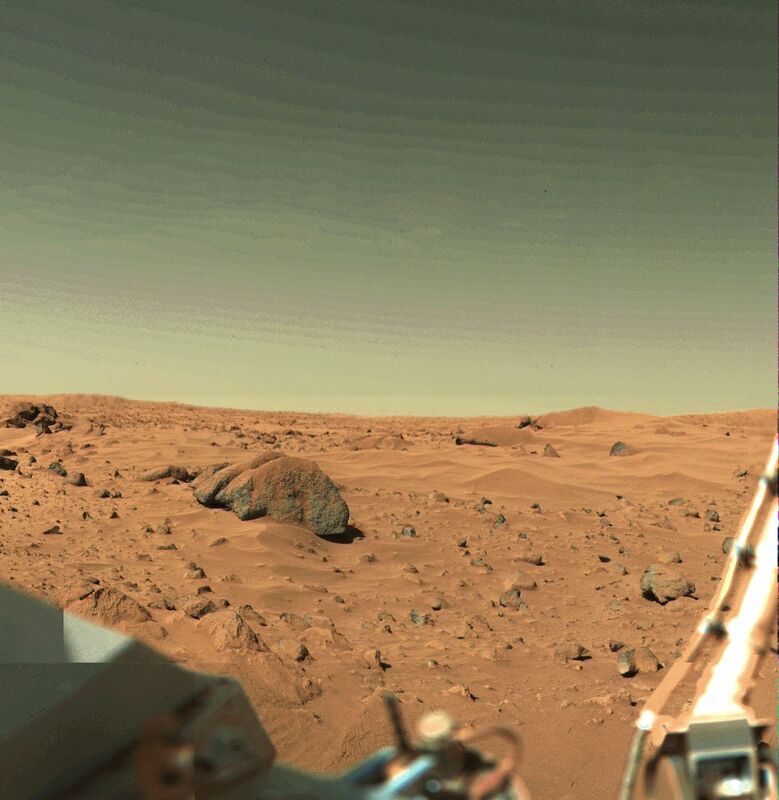 The other three images have colors balanced to approximate what a person would see on Mars. 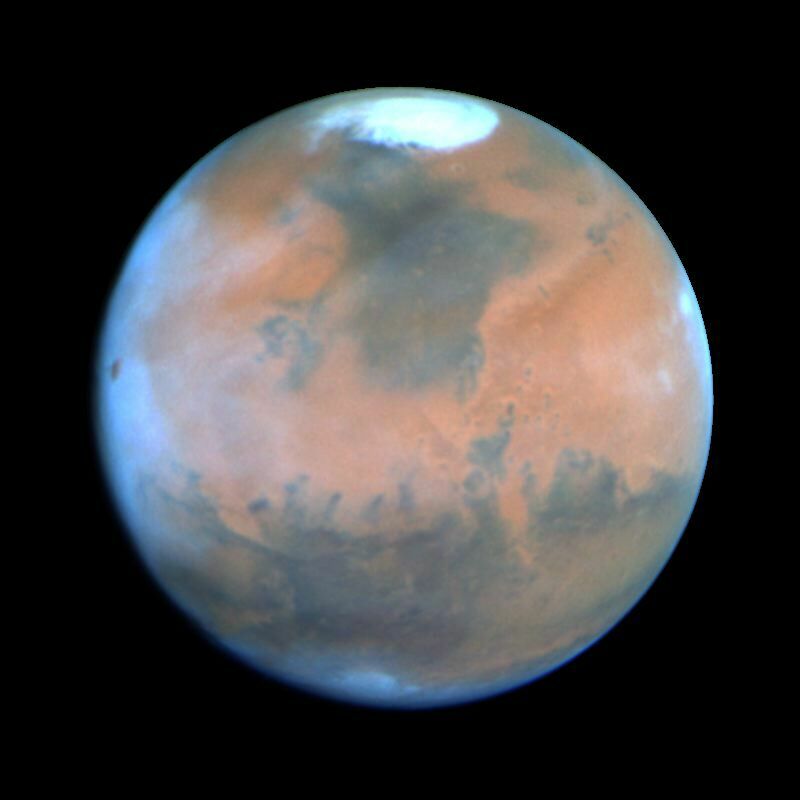 Since the Martian atmosphere carries extremely fine-grained red dust in suspension the "on Mars" images are redder. The following image is from Volume 14 of the Mission to Mars: Viking Orbiter Images of Mars CD-ROM set.